Durability, functionality and beauty are the three main principles defining the “most beautiful metro in the world”. Around three billion Euro (including one fully allocated from European funds) invested for one of the most significant public work projects in Italy: the enhancement has changed the face of Naples and will continue to do so in the future. Its Metro has propelled Naples into the same league as the major European cities. Today, around 42 million people use the metro every year. Furthermore, its stations are within walking distance for nearly half of the city’s population. The Metro is an enormous improvement affecting Naples residents’ quality of living and the way the City welcomes tourists. Furthermore, this has also played an important social role by finally connecting the city centre to the outskirts, Scampia with Vomero and the centre. This system is also so innovative that universities from across the world have studied its technologies and excavations. In fact, it is characterised by stations built 40 metres below sea level and larger than the San Paolo stadium. It also uses technologies at the global cutting-edge. Lastly, the Metro has had the distinction of setting in motion a huge time machine. More than 250 million Euro has been spent on archaeology, leading to the discovery of the ancient Parthenope port, with its over 30-metre-long ships, as well as the place where the Olympics were relocated to in the 1st century AD. This has been a journey through time which, from Angevin bastions, to findings from the Aragonese period, takes us through to the present day. This is a time where the world’s greatest architects have been able to build extraordinary stations which act as the galleries of a huge “must-see gallery” to view works from some of the most renowned contemporary artists – from Sol Lewitt, Michelangelo Pistoletto, Mario Merz, Perino & Vele to Jannis Kounnellis. It is the largest free public art project in Italy. 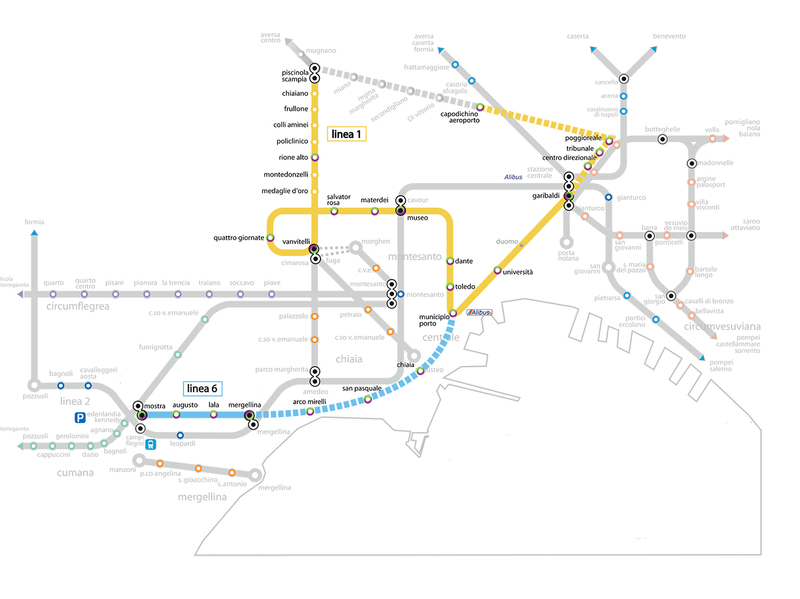 Over the next few years, the Naples Metro will continue to grow, connecting Capodichino to the city, linking the three points of access to Naples (the port, airport, and train station), and bringing the western districts, through Chiaia and Villa Comunale, closer to the city centre. Passengers will be able to reach the airport from Mostra d’Oltremare, to go from Vomero to Centro Direzionale, and from Mergellina to Poggioreale. This is a project that makes the city even more beautiful and easier to live in. Chairman, Metropolitana di Napoli S.p.A.